As of June 2017, several other papers are in review or in preparation and will be added to this website when they have been published. Presentation about the project (in German) made as part of a briefing to Fraunhofer society research institutes. Presentation about the GLADIATOR project made at the 7th International Symposium on Flexible Organic Electronics (ISFOE) conference in 2014. 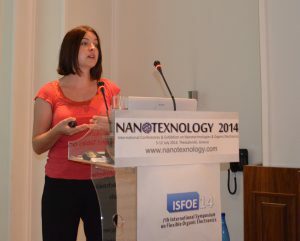 Image shows the leader of the GLADIATOR project, Dr Beatrice Beyer of the Fraunhofer FEP institute, making her presentation at the ISFOE meeting in 2014. Presentation on graphene electrode structuring made at the Graphene 2017 conference in Barcelona. The challenges of making OLEDs on graphene (presented at the 7th International Conference on Advanced Nanomaterials (ANM) in July 2016). Determination of exposure levels during CVD production, explaining the sampling procedures used to test for the presence of graphene particles from CVD reactors at both a university site and that of a company. A manuscript describing the analysis of these samples and tests made in vivo with mice that had been exposed to analagous graphene oxide or reduced graphene oxide particles is in review (Spring 2017). See the 1st project publication lsisted above for the corresponding in vitro results. Description of graphene summer school held in 2016 in Thessaloniki as part of the 10th International Summer Schools on Nanosciences & Nanotechnologies.